Symbolizing rebirth and new beginnings, the daffodil is virtually synonymous with spring. It is the birth flower of March, the same month as the spring equinox. The daffodil is one of the national flowers of Wales because they always bloom on the first day of March, the feast day for their patron saint St David. The daffodil also holds significance in nearby Isles of Scilly, where each year the local Environmental Trust pays to Prince Charles, their annual dues of one daffodil for rent on these unoccupied lands. Another significant spring event involving daffodils occurs from the end of March through April, when the Canadian Cancer Society holds its annual Daffodil Days fundraising drive. The daffodil is recognized by the CCS as the floral icon representing strength, courage and a symbol of life. Narcissus is the botanical name for the daffodil. One reference places the origin of this name with Greek mythology where it was believed the narcissus plant originated from the vain youth, Narcissus. He died after becoming so obsessed with his reflection in a pool he could not leave. The gods turned his remains into the Narcissus flower. This is also the origin of the word “narcissism” which means excessive self love. The word narcissus is also said to have originated from the ancient Greek word Narke – the root word for narcotic – meaning deep sleep, stupor or numbness. The narcissus or daffodil carries toxins called narcitine, that can cause sickness and even death to humans and animals that eat the flower or bulb. Most of the poison is carried in the bulb, which may explain why Roman soldiers would eat them if they fell to fatality, so they could die with mercy. A single daffodil represents bad luck, so always present these cheerful flowers in a bouquet. 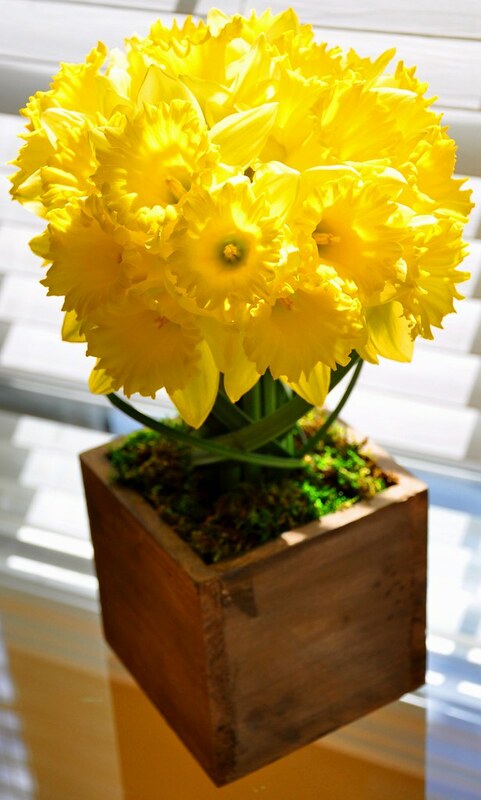 Cut daffodils have a relatively short vase life of 4 to 5 days. They will spring from bud form to full bloom in as little as a few hours. 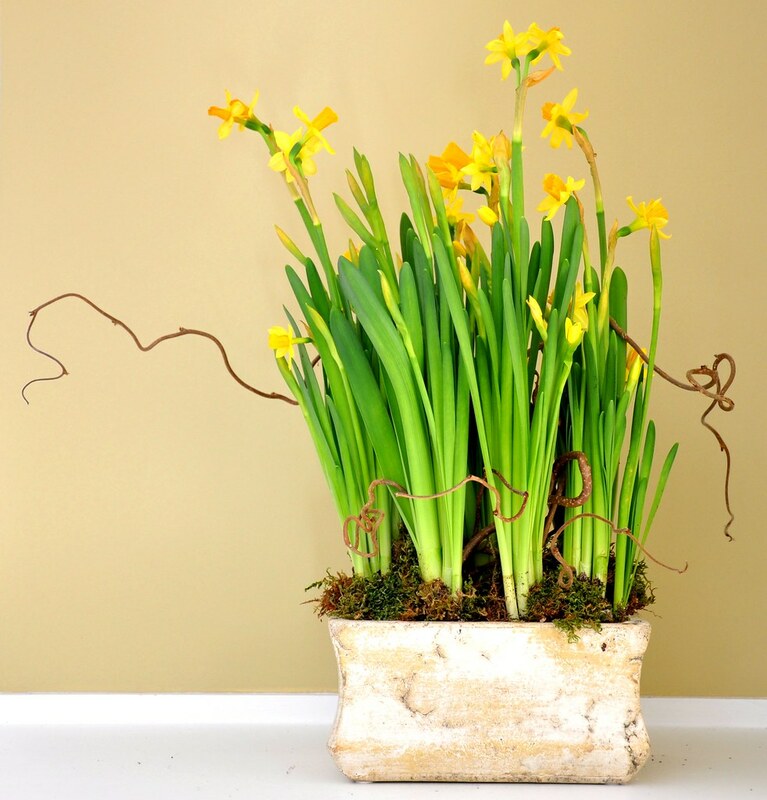 An arrangement of daffodil bulbs will last at least a week if you keep the soil moist and they are placed in a bright room. The combination of all the elements makes this arrangement close to perfection in my eyes. It’s one of my favourites. Line the box or container with heavy plastic if it is not watertight. Soak the floral foam and trim so it fits inside the box, about half an inch below the lip of the container. Hold the longest straightest stem vertically in the palm of your left hand if you’re right handed or your right hand if you’re left handed. Position a second stem to the left of that stem at a slight angle. Position a third stem next to the stem. Turn the group of stems counter clockwise. Continue to position stems and turn counter clockwise until all stems are used. You should have a nice domed shape. Wrap a strip of floral tape securely just under the flower heads. Trim the stems to the same length and wrap another strip of tape close to the bottom of the bunch. Gently push the stems into the centre of the soaked floral foam about 3”. Push the thick end of the bear grass into the foam and gently encircle the trunk, covering the exposed floral tape as you go. Tuck the pointed end of the grass into through the stems or back down into the foam. Complete the look with a piece of sheet moss that has been soaked. Squeeze out the excess moisture and tuck around the topiary base covering the foam. As the daffodil blooms open, they will naturally fit into each other, creating a full canopy. Add water to the foam every couple of days. Once the daffodils have fully bloomed, stop adding water and let the topiary dry. If you’re fortunate, this arrangement will dry nicely and last for a few weeks. Clearly I haven’t been keeping up with my plans for delivering a new floral arrangement each week for 52 consecutive weeks. Life has a way of throwing the best laid plans off the projected path. That said, I have every intention to continue to share with you a fresh blog whenever I can. You may not hear from me for a few weeks. And then I might surprise you with a few blogs close to each other. I hope you will continue to travel with me – even if in a disjointed fashion – as I continue to offer my version of joy and beauty through flowers. This entry was posted in April, Floral Arrangement, Floral Design, Spring and tagged birth flower, blooms, canadian cancer society, Floral Arrangement, floral design, happy flowers, narcissus flower. Bookmark the permalink. Both comments and trackbacks are currently closed. Cathleen, glad to at last have successfully delivered this blog. Do give this recipe an attempt. It’s lovely and would look smashing on the Easter dining table in a series. I’m sure you’ve seen that I love repetition on a theme and this arrangement works beautifully. The daffodill is a very special sign of spring and I am anxiously awaiting the bloom of these flowers in my garden. Shirley, this made the son I know best smile. Who knew that daffodils evoked such emotion. Thank you for sharing this lovely memory. Love this posting about daffodils – it brought back a flood of memories. Similar to you, I watch closely every spring to see the first sprouts breaking through the ground and then I selfishly hope for a few weeks of cool spring temperatures so that the blooms will last as long as possible. Several years ago I was inspired by a special woman (and my mother-in-law at the time) to plant daffodil bulbs throughout the forest on my 2 acre lot. Sandy and I shared a passion for gardening and her favourite flower was the daffodil. I vividly remember our last walk together through the forest on her farm near Owen Sound… it was a cool April day and the daffodils she had scattered through her forest were in full bloom. Having recently been diagnosed with terminal cancer, the walk was a physical challenge for her and an emotional challenge for both of us. We stopped frequently to rest, inspect the blooms and chat about the attributes of each. In spite of the sadness of the time, it is one of my most cherished memories. Sandy died a few months later on Sep. 3. I planted more daffodils in her memory… as I now do every fall. Liz, thanks for this posting. Patty, thank you so much for this story. I remember Sandy with great fondness. She was a remarkable woman. You have given me an even greater appreciation for this beautiful flower because I will now always think of Sandy when I see a daffodil.